"I love almost any squash recipe, and this one makes a great meal all by itself! 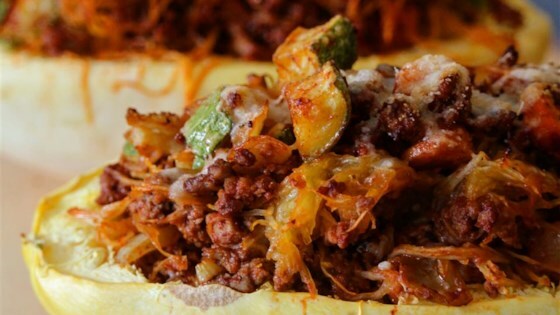 Quick, easy, and one of my favorite ways to make spaghetti squash!" Preheat oven to 375 degrees F (190 degrees C). Place squash in baking pan; pour in enough boiling water to come 1/2-inch up the sides of dish. Bake in the preheated oven until squash is tender, 40 to 45 minutes. Remove from oven; cool until easily handled, 7 to 10 minutes. Reduce oven to 350 degrees F (175 degrees C). Scoop out squash; separate strands with a fork. Reserve shells. Cook beef, onion, and bell pepper in a skillet over medium heat until the meat is no longer pink, about 5 minutes; drain. Stir in garlic, basil, oregano, salt, and pepper; cook and stir until fragrant, about 2 minutes. Add tomatoes and cook until warmed through, about 2 minutes. Stir in squash; cook until liquid has evaporated, about 10 minutes. Fill squash shells with squash mixture using a slotted spoon; place in a shallow baking pan. Bake in the preheated oven until flavors combine, about 15 minutes. Sprinkle with Cheddar cheese; bake until cheese is melted, about 5 minutes. Any ground meat can be substituted for ground beef. You can substitute mozzarella cheese instead of Cheddar. As a side dish this can serve 8 to 10, or it can be used as a main dish and serve 4 to 6. Very bland. I think it needed twice the spices and perhaps some tomato paste. I was looking for a colorful vegetable for a dinner party. This was wonderful, flavorful and everyone loved it. I made it exactly according to the recipe.